The Nogs like to decorate the things they make with what is called "strapwork". This is like a sort of creeper and it seems to grow all over the place. Sometimes it grows so well that it bears fruit. Then the fruit must be harvested and brought home to Noggin's castle to be made into jam. Whoever brings in the most fruit wins. Choose your piece and set it on its corner-place. Throw the dice and the person with the highest number goes first. You may move in any direction except back the way you came. If you land on a space from which a piece of strapwork is growing you may buy the fruit for a penny and put it face-up on the table in front of you. 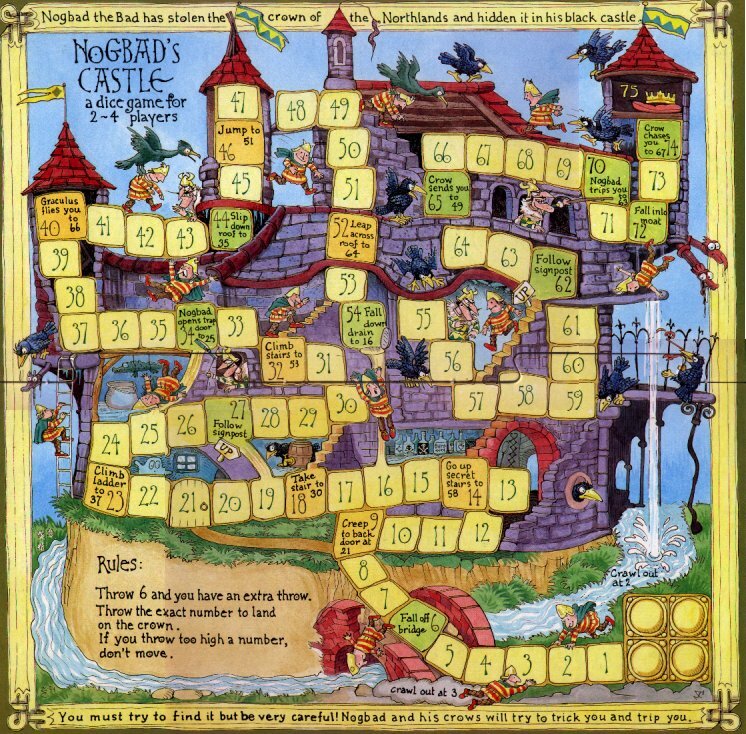 (You can choose to collect one fruit and take it home to Noggin's castle and then come back for more or you can collect several fruits and then take them all home. Once you have taken a fruit home you turn it face down and it cannot be taken away). To reach home you must throw the exact number or go on past. If you land on a red square take a card, do what it says and then put it face-down on the used card space. When all the cards are used, shuffle them and use them again. If you land on an orange circle collect 1p and keep it. 1 penny can be used to add 1 to the number thrown. (2 pennies add 2 etc). With 3 pennies you can buy a fruit. If there are none on the board you can take one from the nearest player on your left who has one. Used pennies are put back on the board. Players may stand on the same space and pass each other. 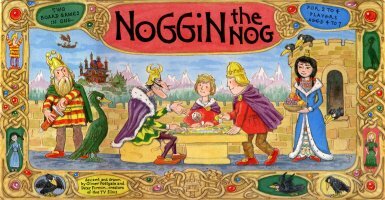 Nogbad the Bad has stolen the crown of the Northlands and hidden it in his black castle. You must try and find it, but be careful! Nogbad and his crows will try to trick you and trip you. 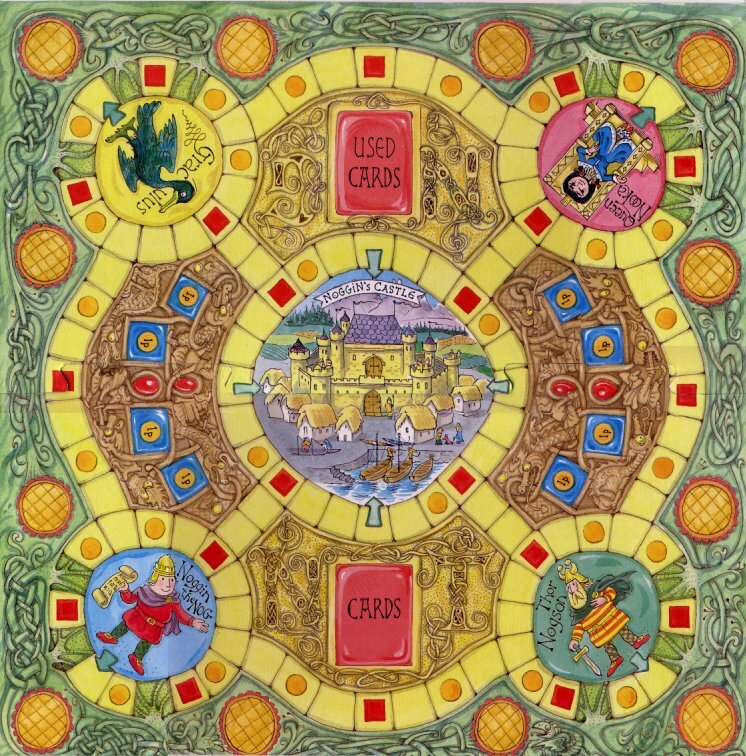 Each person chooses a playing piece and places it on the start grid to the right of square 1 on the board and throws the dice. The person with the highest number goes first, 6 gives an extra throw. Play moves to the person on the left. The objective of the game is to move around the black castle and be the first to find the stolen crown hidden at the top of the castle. To win an exact number must be thrown, if not wait where you are and try again on your next go. Be careful of the many hazards which may slow up your journey. Players may stand on the same square and jump over each other. It's fast, fun and very exciting.